Did you hear about Black Friday? On November 28 the internet will be going deals crazy, with massive discounts on all sorts of products, the most important ones of course, being tech gadgets! 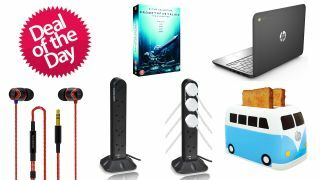 Check out the Black Friday Deals UK page for more information, or just check back here on the day for all the best deals collected all in one place. In the meantime, you can still pick up a bargain or two! How about the excellent HP Chromebook 11 laptop for just £137.98? It runs Google's ChromeOS for simple, internet-based computing. Here's a good present for the sci-fi fan in your family, or even a cheeky gift for yourself - the Alien Quadrilogy AND Prometheus on DVD for just £15. That's just £3 per movie! And if you're looking for some new headphones to go running with or even just to walk around town with, the SoundMAGIC E10 earphones are now just £21.98 on Amazon. And finally, for those lovers of novelty toasters out there, how about the Campervan Toaster? Ideal Christmas present or what?! And just £21.95.